Newsweek Blog Talk: An Innovator? Newsweek and Technorati are in bed together and I’m really hoping it isn’t a monogamous relationship. 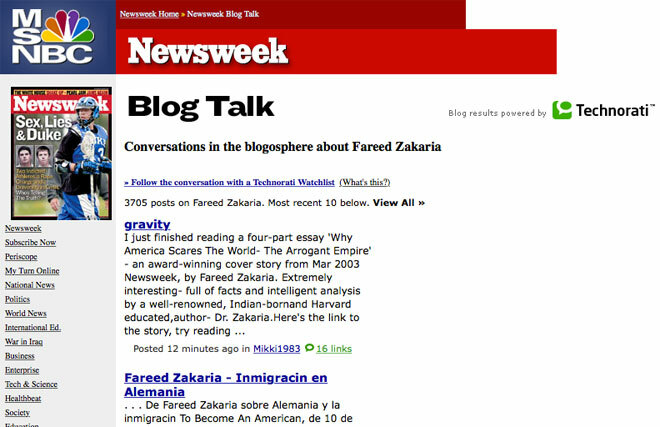 I’m not sure when this started, but Newsweek is now citing “Blog Talk,” creating a contextual column from the Newsweek article page that links to a full Blog Talk page which presents the last 10 blogs posts that have linked to the Newsweek article. This is being done automatically, sans any editorial review. I’m currently working on a project for which I presented this exact context scenario for our blogger design persona. I couldn’t believe the serendipity. So to ensure the API and execution would support our needs, I ran a quick test and posted a response to the “I’m So Sorry” article, linking back to the story URL. Within 10 minutes of pinging Technorati, my post appeared on the Newsweek page. Okay, that’s very progressive. Sure, it’s only a glorified trackback system, but the underlying philosophy has huge implications. We’re quickly moving to a sustainable model for presenting the individual perspective on the same level as mainstream media’s editorial-driven journalism. It’s a win-win; a site like Newsweek gets an increased blogger readership and bloggers have the opportunity to share their perspectives with people that may not even know how to navigate the scattered blogosphere. From my perspective, this is the first step to truly legitimizing the blogosphere. What’s next? Well, if Google, Yahoo! and other mainstream news aggregators begin to index blogs for their search queries, we’d be one step closer to breaking through the mainstream media stranglehold on information for the average American that receives their news on-line. All of this is what the promise of Community TV was supposed to provide twenty years ago, but ran into the obvious production challenges. This is really good. It’s good for business, good for bloggers, and most importantly, good for bubbling up numerous perspectives of a story to the surface. This is discourse.